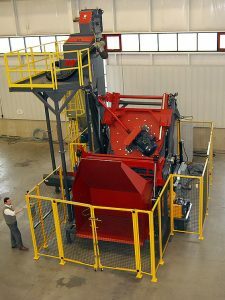 We’re pleased to announce Rosler’s RMT multi-tumbling batch blast machines. Using a special rotary barrel design, these durable units produce excellent blast coverage results and compared to conventional tumblast machines, they have no “pinch points” to damage even sensitive parts. The RMT also features a simple design with few moving parts ensuring high up times and low maintenance costs. Easy automation with custom-made loading and unloading equipment make integration into existing systems a breeze. Plus, with the rotary barrel made of highly wear-resistant manganese steel, RMT machines provide years of reliable service. Rosler’s RMT machines suit every capacity requirement from 3-34 cu. ft. batch sizes and include a wide choice of blast turbines from 15-75 hp.